Which version of the Executor/Executioner Landing Module would you like to see play tested? So the draft list for the Dark Eldar play testing is almost complete. It has been reviewed by a number of learned individuals, who have picked up many of my mistakes - any others remaining are completely of my own devising. However, one issue remains unresolved in my mind: The Executor/Executioner landing Module. I cant really come to grips with it. I have only ever seen one conversion and have never seen it played with or taken in my own forces. I would like to propose a fairly drastic change to the Executioner that will change the way it plays into a landing craft with the speed of a Bomber. I also think it is a wee bit too pricey for regular tourney play. I would therefore like to reduce its cost, by reducing its transport capacity, decreasing its weapons loadout and increasing its vulnerability. Below is my draft proposal and the NetEA and EPICUK comparison. I know the unit itself needs to be viewed in the context of the entire list to truly judge its value and the effectiveness of the nerf or otherwise - so for arguments sake lets say the draft list looks almost identical to the EPICUK List. DC 4,Shadowfields 3, Critical Hit Effect: The Executioner’s shield generator is breached, the ship is wracked with explosions, destroying the ship and any units on board. Any units within 5cm of the ship suffer one hit on a 5+. Fearless, Reinforced Armour, Self Planetfall, Transport (may carry up to 12 of the following units: Warrior, Incubi, Haemonculi, Hellion, Mandrakes, Grotesques, Scourge, Wrack, Warp Beasts and Wych units. In addition may carry up to six armoured vehicles or light vehicles; or up to two of the following: Barge of Pleasure and Vessel of Pain, in any combination (warengines count as a number of units equal to their starting DC). spaces each. In addition, the Executor may carry up to 16 infantry units of any type). Critical Hit Effect: The Executioner’s Phantom Lances are damaged and may no longer be fired. Any further critical hits will cause an additional point of damage. Notes: Fearless, Planetfall, Reinforced Armour, Support Craft, Transport (may carry up to sixteen of the following: Warrior, Incubi, Haemonculi, Grotesque, Mandrake, Warp Beast, Wrack, Wych, Hellion and Scourge units. In addition may carry up to eight of the following: Talos, Raiders, Venoms and Ravagers or up to two of the following:Barges and Vessels of Pain.). Please select one option you would prefer to take to play testing. Last edited by JimXII on Sat Nov 05, 2016 12:03 pm, edited 1 time in total. I like the new one but with reinforced armour, which I think a War engine would have. 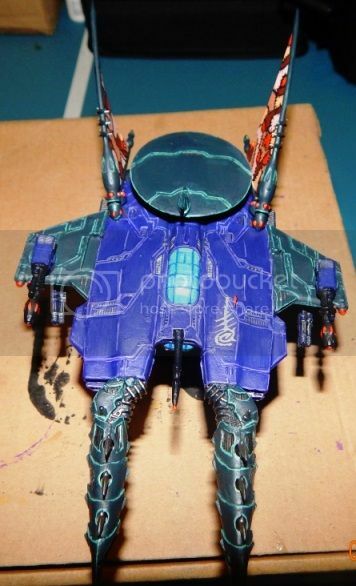 I would probably add AA 5+ to the hail of splinters profile, as this is suppose to be a large transport which the Dark Eldar would have enough AA weapons and gun ports to protect it with. The DC and shields look OK for its points. It just becomes a larger version of the Slavebringer but with self planetfall. The lack of the Webway portal would be OK, as it is now a bomber, and the portal would be wasted on it once it has delivered its payload. I vote the EUK one as it has the right combination of cost and ability, although I don't like it being a War Engine as it is. I'd still prefer it to be an AC/Bomber, and the wiped-out crit is appropriate for something like that, but the rest of the EUK stats is where I'd want something like that to be. It's priced right (so it can't typically be taken with a titan) and has appropriate firepower and capacity for that price. A tweaked version of the draft proposal would work also, if it were priced like the EUK entry, gained some resilience, capacity and had the weapons tweaked - losing the 60cm AA/merging into the splinter storm weapon (3x5+ seems quite reasonable for the ~550/600 point mark, especially on a fearless war engine) and a Desolator or Phantom Lance buff. For me, the key matter is to keep it high enough in cost that it can't be taken in a typical 3000 point game together with a titan, then balancing the statistics to that value to retain usefulness for the army as a whole. High priced stuff is always going to be very, very difficult to balance though, look at the titans in just about any list or the Squat war engines for examples. They need to be very, VERY good for such a big investment, so keeping them from being just too damn good is a tough act. Last edited by Doomkitten on Sat Nov 05, 2016 12:18 pm, edited 1 time in total. Good Pickup! It should be reinforced armour! Edited the post to reflect that. Well I still ave only seen 1 executioner, as yours was the one I found on the internet! Good job Deb, I looks great! I think the titan v Ex in a 3k list is a very valid consideration. But shouldnt be too much of a limitation. Especially if the Ex is nerfed. But your suggested changes to the Epic UK variant seem really good. And your point about the difficultly in balancing high priced units is very valid! Thats why i think just sticking to a know entity for the moment may be the way to go. I have one built also, it's in my TOEG thread. the Net-EA and E-UK variants are interesting propositions, though given the observation that the Executioner is rarely taken, I think it would be usefull to explore why this happens - is it the price / effectiveness of the unit, or perhaps (as I suspect) that the other units and formations are more cost effective. Another problem generic to both is the notion of dropping a large number of units / formations somewhere on the table; ideally this needs to happen near the enemy (probably on a flank) but that in turn usually puts the formations at risk of a counterattack. Self-planetfall means you can shoot something on landing and then assault with the contents - but you now have the BTS formation surrounded by enemy, and 5+RA is relatively weak compared with the normal 4+RA enjoyed by other titans. In the past, 'Flying titans' were generally discouraged because of power-creep in the air-game which has knock-on effects elsewhere (as discussed in other threads). The basic problem is that they can escape off table which dramatically reduces the opponent's chances of catching / destroying it. While disengaging also risks the destruction of the next most expensive formation awarding the BTS, in practice it actually makes this objective almost unattainable which is seen a rather 'gamey'. I know Rug's been using the Executor quite a lot, might be worth someone messaging him for his views? Nice one mordoten! Purple rain of death! Me likey! Have you used the beast much? And with what list? Sage advice again ginger. I think personally, that is to say completly anecdotally, i think it is a combination of what you have described as to why it isnt taken. Is a massive chunk of a 3k list and then you need to fill it to maximise its utility. Another points gobbler! I dislike the webway on the epik uk variant, but thats mostly cause i think if you have the mobile portal and the webway and the executor it becomes a bit too much. And maybe a bit op. Thoughts? Has anyone gots rugs email addy? I would love to gear his thoughts. Great looking exy again Deb! I never liked the Support Craft version because its big and slow. The DE are neither of those things so it always seemed odd to me. So I approve of the idea of it being a landing craft. In that regard I think its point value (and effectiveness) should be lowered to ~450 so that it costs less than the Titan and therefore if you take both the easier to kill titan stays on as BTS if you have all other small/medium formations. At that cost it doesn't need RA since it has shadowfields to fend off AA. 12 units of DE infantry isn't as scary as 12 Marines by any stretch though I can see uses for putting 2 units of warriors in raiders in it. In fact this is probably the only way I'd take raiders instead of venoms or barges.